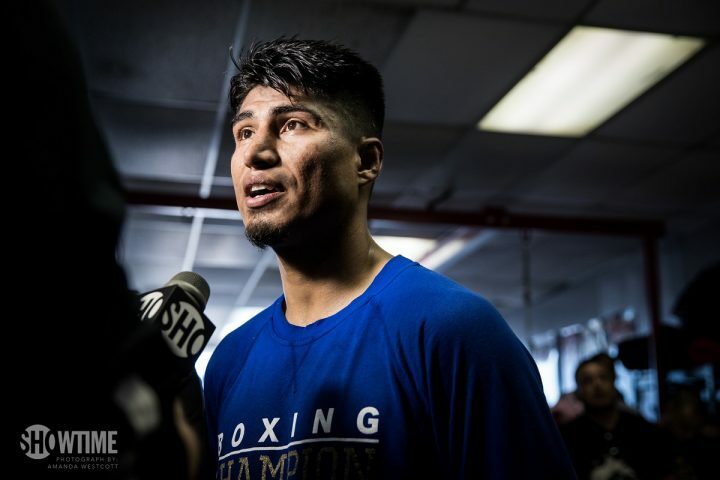 By Jeff Aranow: WBC lightweight champion Mikey Garcia and IBF belt holder Robert Easter Jr. are set to face each other on July 28, according to ESPN. The announcement is due at any time. Garcia (38-0, 30 KOs) and Easter Jr. (21-0, 14 KOs) will be putting their unbeaten records on the line in this interesting unification fight. The 27-year-old Easter Jr. is likely going to be out of his class against Garcia. There’s a significant difference in power and hand speed in this fight. Easter Jr. has struggled in his last two fights against Javier Fortuna and Denis Shafikov. Easter’s 12 round split decision win over Fortuna last January was questionable to say the last. The fight took place at the Barclays Center in Brooklyn, New York. More than a few boxing fans booed after the fight, believing that Fortuna should have been given the ‘W’ in the fight. ”Fight is made from what I am told and could be announced any time. July 28,” Rafael said on ESPN.com about the Mikey Garcia vs. Robert Easter Jr. fight. Mikey has got to do a better job against Easter Jr. than he did in his last fight against former IBF 140 lb. champion Sergey Lipinets (13-1, 10 KOs) on March 10. Mikey struggled with the punching power of Lipinets, and his own shots had no real effect on the fighter from Kazakhstan. In moving back down in weight to lightweight, Mikey’s punching power should be better, but we’ll have to see. Mikey has been looking flabby in his vacationing in Hawaii, and he’s obviously been eating well. There are rumors that Mikey’s weight was at 170 pounds. That’s a considerable amount of weight that Mikey would need to lose if he’s going to get back down to 135. Mikey can probably take the fight off, but what kind of condition will he be in on the night of the fight? If training camp is going to be a partial fat farm for Mikey, it’s not going to be good for him when he gets inside the ring with the always in shape 5’11” Easter Jr. This is not the type of fighter that you want to be out of shape when you fight him. Mikey, 5’6”, will be giving away 5” inches in height and an incredible 8” inches in reach to Easter Jr. For a fighter who is accustomed to be the taller guy, it could be a problem for Mikey. He does well when he’s towering over his 5’4” opponents, like he was against Dejan Zlaticanin last year in January, but he wasn’t nearly as comfortable against the 5’7” Lipinets last March. It was Lipinets that was the taller guy by 1” inch, and Mikey wasn’t able to land his shots without getting nailed in return. It’s going to be hard for Mikey to get in punching range against the long-armed Easter Jr. without getting clipped by something. Easter Jr. looks thin, but he’s able to generate good punching power with his tall frame. You can’t rule out an upset in this fight if Mikey is weight drained from getting down to 135, and if he can’t get in punching range without getting hit frequently. The winner of the Garcia-Easter Jr. fight could meet up with WBA 135lb champion Vasyl Lomachenko in 2019. By that time, Lomachenko is expected to have another title in his possession after he beats WBO lightweight champion Ray Beltran. Both guys are with Top Rank, and the boss of that promotional Bob Arum is in a real hurry to match them up against each other on December 8. Arum wanted to make the Lomachenko vs. Beltran fight for August 25 on ESPN, but Lomo suffered a shoulder injury in his last fight against former WBA lightweight champion Jorge Linares last month and he had to have surgery on his right shoulder. The surgery was a success. There’s a very good chance that by the time Mikey and Lomachenko meet up in 2019, both will have two titles. Lomachenko will have the WBA and WBO lightweight straps, while Garcia will have the IBF and WBC belts. Mikey has won all four of his fights since coming back from his 2 ½ year layoff in 2016. His wins have come against Elio Rojas, Dejan Zlaticanin, Adrien Broner and Sergey Lipinets. Mikey wasn’t that impressive against Lipinets last March. Lipinets gave Mikey all he could handle in landing a lot of heavy shots. Afterwards, Mikey’s face was badly marked up. There’s no way you can look at that fight and say that Mikey shined, because he was lucky to get the victory. Mikey’s power did not carry up with him to 140, even though he was given the victory by the scores 116-111, 117-110 and 117-110. Those scores were way too wide for the fight that took place. At best, Mikey won by 2 rounds. At worst, you can call it a draw. Moving back down to 135 will be good for Garcia, because he belongs at lightweight. Mikey does NOT belong at 140, and the boxing fans would see that if he tried tangling with Regis Prograis. That would be a terrible mismatch. Mikey is too weak for Prograis, and he’d likely wind up getting knocked out like Julius Indongo did last March. Garcia vs. Easter Jr. isn’t the match the fans want to see at lightweight. People are waiting for Mikey Garcia to face Lomachenko, and they’ve been waiting for a long while now. Mikey wanted to fight Lomachenko in 2017, but the Ukrainian fighter wanted to take his time moving up in weight. It’s now a year later and finally Lomanchenko has move the move up to 135. Unfortunately, Lomachenko is recovering from his shoulder surgery, so he probably won’t be available until sometime in 2019. If everything goes well with Mikey in his fight with Easter, it’ll be good to finally see Lomachenko-Garcia battle it out. The fight has been marinating for too long already, and the boxing fans want to see it before one of them ends up getting beaten. Lomachenko’s recent shoulder injury might be the first sign of age setting in. He’s now 30, and that’s when the smaller guys start falling apart. With Mikey, he’s getting so heavy in between fights now that he’s living the good life with all the money he’s made.